Roman Holiday is so light and enjoyable that it almost seems wrong to ascribe more to it than that. Nevertheless, the film keeps turning up on “greatest film” lists, including the Top 250 on IMDB.com. If it were pure fluff, the film probably wouldn’t have aged as well as it has. So perhaps there really is more to it than meets the eye. One could say that Roman Holiday is about the semi-permeable boundary between classes... that it’s possible for any two people to make a personal connection, but only on holiday when everyone has left duty, class, and work behind. It’s also about motives and actions. Motives drive your actions, but in the doing of the thing, you may realize a different value from what you intended. In Roman Holiday, the princess (Audrey Hepburn) of an unnamed country gets frustrated and bored by her rigid schedule of formal appearances. The doctor can’t help except to give her a sleeping drug, so she helps herself by sneaking out of her Italian host’s palace in the back of a delivery van. By the time she hops out on the streets of Rome, she’s ready to fall asleep on a bench. Luckily, the first man to come by is an honest and honorable — mostly — American reporter (Gregory Peck) who doesn’t recognize her at first. He lets her sleep it off in his apartment (“is this the elevator?” she asks). He rises early and discovers who is in his apartment when he sees her photo in the morning paper. The princess has suddenly “taken ill” says the headline, and all her appointments have been cancelled. He sets out to get an exclusive story with the princess by pretending he doesn’t know who she is, but charming her and spending the day with her, doing whatever she wants to. Tomorrow, he’ll write it all up as an exclusive exposé. His photographer friend declares opens season on princesses, in a spine-chilling prediction of the end of Diana. Over the course of a day, the reporter and the princess become simply a man and a woman. There is always some reminder that their genuine friendship can never last. But at least for a single day, on holiday in Rome, anything is possible. The performances and charisma of Hepburn and Peck are unforgettable. They probably account for much of the popularity of the film. An extra feature on the DVD tackles Hepburn’s striking beauty head-on. It credits her natural personality, her slender figure, and her on-target instincts about fashion that supplement the work of her long-time designer Hubert de Givenchy. As for Peck, well, what young woman wouldn’t be enamored of such a clean and handsome good guy. Peck is enough older that their affair seems a little awkward, but both are so likeable that it’s hard to worry too much about that. As enjoyable as the film is, I wouldn’t call it a masterpiece. It is a fine example of the screwball comedy, with a dashing hero, a strong and beautiful heroine, and a colorful sidekick. Add a dash of an exotic setting and you have the makings of a great success. The film lacks only some complexity and subtext that would really push it into the royal realm of masterpiece, but you won’t find a finer commoner than Roman Holiday. There are several featurettes on this “Centennial Collection” edition (it’s the 100th anniversary of Paramount, not Roman Holiday). As mentioned above, the one on Hepburn’s beauty is refreshingly frank. Hepburn is a knockout, and this featurette takes that as its starting point. Through interviews with those who knew her, the documentary explores what was so magnetic about her: a combination of personality — fragile but not weak, her slender figure, and a great sense of fashion. There’s another featurette on the restoration of the film that shows several examples of before and after. To my eyes, the difference is subtle. It is as if a fog had been cleared from behind your TV screen. The tonal range hasn’t changed much; it’s mostly an improvement in detail. Nerdy technicians talk about “restoration” versus “preservation.” It’s nice to see the techy nerds get the spotlight, especially on the DVD for a film which is so much about charisma and beauty that the only nerd allowed is the sidekick. The other interesting back story involves the film’s screenwriter, “Ian McLellan Hunter,” who won an Oscar for best original story. But the real writer was blacklisted screenwriter Dalton Trumbo. This DVD features a title card that gives Trumbo writing credit, which ought to have been impossible. The original prints all gave credit to Hunter. But the restoration team was able to find the original background footage under the screenwriter’s credit, and they were able to finally give credit to Trumbo. All said, there are 7 extra features on Disc Two. Some of them feature a copyright date of 2002, which would have been the 50th anniversary of the movie. That means this DVD release is, to some extent, a repackaging. But having missed the previous DVD release, I’m happy to recommend this one. The film has been restored. An extra feature even explains the process and shows examples to prove how much better it is. Nevertheless, I noticed a very subtle color shift between scenes. The film is black and white, and I’m watching it on a color TV. When the editors cut from one shot or one scene to the next, sometimes the color seems to go from slightly greenish-gray to slightly magenta-ish-gray. It’s not very distracting, but on a disc that boasts its restored picture quality, it was a little surprising. Watch the movie first. Then pick one or two extra features. If you can’t take your eyes off Hepburn, try Remembering Audrey. 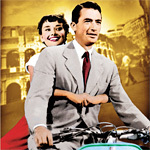 If you’re a technophile, try Restoring Roman Holiday.